Welcome to the game of parking cars from your cell phone. Ride in the car to start a new adventure in the parking. You must find a safe place to park the car without crashing or damaging the other vehicles that are parked in the parking lot. In the upper right corner you will see a green bar that indicates the health of your vehicle. If this bar remains blank you will have lost the game and you will have to restart the level, being careful not to hit so much against obstacles and other vehicles. Some say that parking cars is one of the hardest parts of learning to drive and today you can see it in first person with this wonderful game. 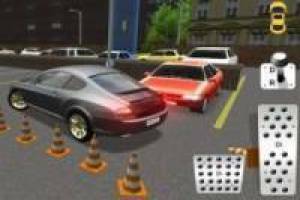 Enjoy the game Parking cars, it's free, it's one of our Car games we've selected.